The US line was the first in game, and with all the new ships and gimmicks, all of the Origional US line is in desperate need of a passover and fix to match the power creep of other nations. Montana was buffed in the past. This ship is tanky enough. Montana is more than fine in her current state. In fact, she's one of the 3 go-to Battleships for competitive. Finally the frontal armor of the main battery turrets are missing 4.5" (114mm) of STS and the other sides are presumably missing some armor too. Deck armour is often tweaked for game play reasons. KGV, for instance, had more deck armour than Yamato has in game. What you're seeing is the 3rd deck, which is one deck below the main armor deck which is there but not visible in the armor viewer. Though in-game it's modeled as 150 mm rather than the 178 mm (7 inches) that it was actually designed with. The weather deck is also only 38 mm rather than the designed 2.25", or 57 mm, ostensibly for balancing reasons. then what's the point of armor viewer? the french ones have 150mm in viewer, does that mean there are invisible additional armor as well? It’s becaus not all ships carried 1 layer of armor, some ships used a few thinner layers sosced apart to get the shell to slow down before it can strike a more vulnerable spot. I have found that if you play around with the armor viewer in the different sections of it you can find some of them and then add up the layers to get a rough total estimate. Also looking up real world versions can be helpful as well since game does not usually stray that far from real world versions. With some exceptions of course. French and US armor schemes are completely different, with different expectations when designed. How so? Yamato deck armor is 57 mm weather deck (buffed from 35-50 mm historical value) and 200 mm main armor deck, while the KGV deck armor is 25 mm weather deck (nerfed from 32 mm historically) and 127-152 mm (slightly buffed from 4.88" to 5.88" historically) and 16 mm splinter deck (which should have varying height; in game it's cutting the boiler room short). There is another armor plate inside the casemate, which you cannot see using the armor viewer. Montana's deck armor in game consists of the 38mm deck, a 150mm deck (that starts between the 38mm and 409mm belt armor) and then the 19mm citadel roof. Why is that so? Because of the citadel buff the Montana received some time ago. Before that the citadel roof was 150mm, but the citadel was much easier to hit. That was changed, and not the citadel is lower however at the cost of the citadel roof itself being thin. Aren't all T10's armor basically tinfoil to other T10 guns? I don't have one myself but from what i've seen in matches is anyone caught out gets blasted to bits rather fast BB or not. Using a personal anecdote is really not a good basis for judgment on whether a particular ship needs a buff or not. Looking at the statistics for tier 10 battleships the Montana consistently performs worse that the other options under every category of player experience level. There has certainly been a power creep that has left the USN/IJN lines in need of a rework to make them more competitive. Looking at the Iowa/North Carolina statistics as well, they are also last in WR/damage for their tiers with the Japanese equivalents also toward the bottom. I do not own nor play Montana. I'm talking actual statistics of UPPER players. Now people just sit full broadside in it and don't get punished for it. Part of why the NC and other US BB stats are so depleted is who play them. They are extremely popular, and a good amount of people who play them are sub-par. If you sort their stats to filter out the top and bottom percentiles, NC is very balanced and if you leave the NC, the NC is the top tier 8 BB by far. NC is most accurate tier 8BB, has good AA, pretty good armour, good concealment. What more do you need. What about it? The Iowa and South Dakota classes (slightly different, but functionally close enough) also have a 1" STS splinter deck over their magazines beneath the 5.5" + 1.25" STS MAD (~6.3" equivalent with the lamination formula) which is beneath the 1.5" weather deck. 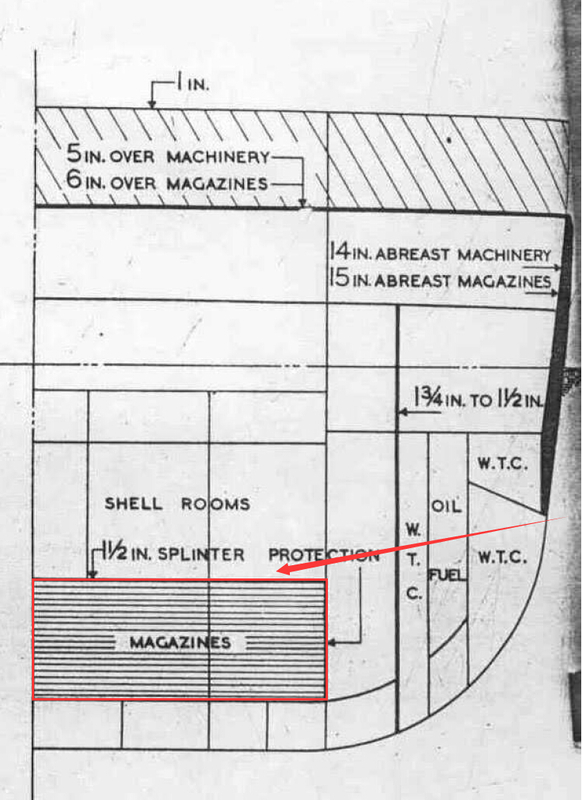 Both ships powder magazines are also at the very bottom of the turret structure, the Americans magazine splinter protection is just mounted higher up to prevent fragments from entering the shell rooms as well. Yamato has a flat 8" of MNC armor over the entirety of its citadel, including the magazines (actually I think it may be thicker around the uptake, but I'm on mobile so I'm not going to bother confirming) and this is beneath the roughly 1.5-2" weather deck. That 8" armor deck is the single thickest ever placed on a warship to the extent of my knowledge. KGV's deck armor is not the end-all-be-all, even over the powder magazine. What about it? The Iowa and South Dakota classes (slightly different, but functionally close enough) also have a 1" STS splinter deck over their magazines beneath the 5.5" + 1.25" STS MAD which is beneath the 1.5" weather deck. Both ships powder magazines are also at the very bottom of the turret structure, the Americans magazine splinter protection is just mounted higher up to prevent fragments from entering the shell rooms as well. Yamato has a flat 8" of armor over the entirety of its citadel, including the magazines (actually I think it may be thicker around the uptake, but I'm on mobile so I'm not going to bother confirming) and this is beneath the roughly 1.5-2" weather deck. KGV's deck armor is not the end-all-be-all, even over the powder rooms. You clearly didn't read my original post about it. I was saying how KGV has better armour realistically than Yamato has in game. Not saying KGV had better armour. Most of KGVs armour was devoted to her belt and torpedo protection which is better suited for operations in the Atlantic. Makes no sense in that context. Neither ingame nor in real life does KGV have better deck protection than Yamato. Furthermore, deck armor values are seldom tweaked for gameplay balance outside of paper ships or ones that were never completed (outside of extremity/hull plating like the 25/32 mm division). To the extent of my knowledge the only finalized and accepted design ingame to have a noticeably incorrect value is Montana, which WG could always handwave as having chosen some different design study prior to its acceptance since the speed is also artificially buffed. NC citadel was never lowered, it had always been at the waterline and all the lowering that was done to Montana and Iowa was to bring it down to the waterline, the same height as the NC. Arguably the lowering is justified for the Iowa because its belt armor is only 2 mm thicker (307 mm versus NC's 305 mm) and slightly more inclined, which at in-game ranges made very little difference in terms of protection. You could argue that because the Montana had much thicker belt armor of 409 mm, it didn't need to be lowered to the extent that it is now, but what did the so-called TOP players think of Montana prior to the buff? It had the slowest rudder shift and the longest citadel, which when combined with the height made it extremely vulnerable, considerably more so than even Yamato due to the sheer length and the lack of angled armor deck edges. Furthermore, if you consider the Montana to be too difficult to punish full broadside, then what about the Republique with a turtleback that makes it immune to citadels from more than 6 km? Or the GK with a turtleback that makes it immune to citadels at most ranges? Or Conqueror with citadel buried underwater? @Big_Spud, To clarify, the South Dakota main armor deck laminate is 5.3" + 0.75" outboard and 5" + 0.75 inboard, while I believe Iowa is a uniform 4.75" + 1.25" laminate. American battleship powder magazines don't quite sit as low as British ones, though still below the waterline. Then again, the British went way overboard with magazine protection because of they learned all the wrong lessons from Jutland. Not depicted in that image though is the machinery spaces, especially the boiler rooms, the top of which actually stick out above the waterline. NC citadel was never lowered, it had always been at the waterline and all the lowering that was done to Montana and Iowa was to bring it down to the waterline, the same height as the NC. Arguably the lowering is justified for the Iowa because its belt armor is only 2 mm thicker and slightly more inclined, which at in-game ranges made very little difference in terms of protection. You could argue that because the Montana had much thicker belt armor, it didn't need to be lowered to the extent that it is now, but what did the so-called TOP players think of Montana prior to the buff? It had the slowest rudder shift and the longest citadel, which when combined with the height made it extremely vulnerable, considerably more so than even Yamato due to the sheer length and the lack of angled armor deck edges. Furthermore, if you consider the Montana to be too difficult to punish full broadside, then what about the Republique with a turtleback that makes it immune to citadels from more than 6 km? Or the GK with a turtleback that makes it immune to citadels at most ranges? Or Conqueror with citadel buried underwater? My bad with NC, got confused because of Alabama. I was saying KGV IRL has better armour than Yamato has in the game in reference to how armour values are frequently tweaked. But I get your point. However, I really don't see a need to buff the Montana. Any benefit in survivability that the KGV has over the Yamato is because of the citadel volume, not the armor itself. Wargaming chose an extreme simplification of the KGV's citadel volume (and by extension, the Monarch and Lion as well) by making the height uniform and considerably underwater, like this, and makes it extremely difficult to hit. A realistic KGV citadel would actually look like this. And I would even argue that the engine room height should be raised to the level of the boiler rooms if that reduces model complexity. Furthermore, the KGV torpedo protection system is rather mediocre; the system depth was only 13.3 ft, considerably shallower than the 17.9 ft depth of the South Dakota or even the 16.7 ft depth of Yamato, though KGV (and South Dakota) uses liquid loading in its system which increases effectiveness. It's only with the addition of "sacrificial" auxiliary machinery spaces that the system depth becomes comparable to the South Dakota, though given that those spaces contain dynamos and other essential equipment, considering them sacrificial is a rather loose usage of the term. It's been claimed that the KGV's system is rated for 1,000 lb TNT, but that's really quite questionable, and I remember someone brought up a Navweaps discussion where the TNT rating of the design may have been erroneously attributed to a low-order detonation. WG refuses to recognize STS as armor plate...which really screws the US lines. Odd though...the viewer shows the splinter deck but not the main armor deck.